During the design of a new building or retrofitting of an existing one, it is important to reliably assess the indoor humidity levels of the building as it can potentially affect the building envelope durability, occupants’ comfort and health risks associated with mould growth. Simplistic assumptions of indoor humidity profiles, which ignore the dynamic coupling of the indoor environment and building enclosure, may lead to inaccurate conclusions about the indoor environment and moisture performance of the building enclosure. 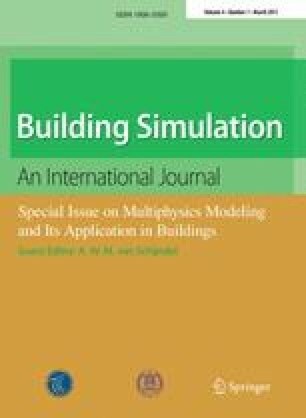 In this paper, a whole-building hygrothermal model called HAMFitPlus, which takes into account the dynamic interactions between building envelope components, mechanical systems and indoor heat and moisture generation mechanisms, is used to assess the indoor humidity condition of an existing occupied house. HAMFitPlus is developed on SimuLink development platform and integrates COMSOL multiphysics with MatLab. The basic input parameters of the model are discussed in detail, and its simulation results are presented. In general, the HAMFitPlus simulation results are in good agreement with the measured data. An erratum to this article is available at http://dx.doi.org/10.1007/s12273-011-0033-8.